Our website is currently under construction, apologies for any inconveniences this may cause. Truckrent Ltd was established in 2007 in response to a need for a high quality, fresh and dynamic alternative for LGV operators seeking Rental and Contract Hire options in today’s fast changing industry. Based in South Lincolnshire, we offer the best service levels to customers nationwide. With vast experience of the rental business and a detailed understanding of customer needs and expectations ?especially in the time critical chilled distribution sector - Truckrent offer an efficient, flexible service which the large players struggle to match. Central to this service is the quality of the equipment we operate. Truckrent currently choose Scania, DAF, Volvo and Renault in a fast expanding fleet as the best alternatives on the market in terms of reliability, fuel efficiency and driver comfort. 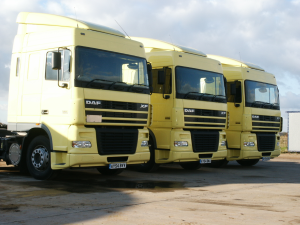 The later additions meet Euro 5 emissions regulations and for customers still to embrace Digital Tachographs, we also operate some of the last vehicles to be manufactured with analogue type recorders. All our fleet is LEZ compliant. In addition, a number of our lighter vehicles are now equipped with ‘Wet kits?for tipper operators in the bulk grain and sugar beet sector where payload is critical. Each of these vehicles has a side-mounted hydraulic tank, ensuring that they can be operated just as easily with refrigerated or curtain sided trailers when not employed in a tipping role. As we operate only plain unlettered vehicles, many customers choose to apply their own vinyl livery to our vehicles. If you require this service yourself, we can assist you. But the vehicles are only part of the package. We deal with each of the above named manufacturers?dealers and have our own nationwide network of independent service agents. However, even the most reliable vehicles sometimes suffer mechanical failure; if this should happen customers can rest assured that a call for help will go directly to one of our team, NOT a remote call centre operator with no knowledge of you or your business. We understand the 24 hour nature of modern transport ?we have recent in-depth experience of it from your angle too ?so we know the key factors are speed of response and communication. A call to us means that we handle the incident and keep you informed every step of the way, making your decision making process that much easier and enabling you to keep your customers informed. We don’t offer gimmicks or slick sales patter, we sell ourselves on the service we provide, and we are constantly striving to expand and improve the options we offer. We don’t accept second best ?now you don’t have to either. Please call us ?you won’t be disappointed.